As a beginning data scientist, you’ll have quite a few subject areas that you need to learn (and eventually master). While you’ll certainly need to learn some math and statistics, math and stats are not the first things I recommend to most beginners. Almost always, I recommend that people start with data visualization. The reason for this, is that data visualization is so critical to almost every part of getting things done as a data scientist: reporting, analysis, exploratory analysis (e.g., EDA prior to machine learning). You need data visualization constantly. It’s necessary for nearly every data scientist at all levels. Furthermore, I’ve argued that at junior levels of a data team job hierarchy, data visualization (when combined with data manipulation) is sufficient for being productive. If you’re a junior member of a data team, your core responsibilities may exclusively revolve around visualization (i.e., reporting, analysis, etc). Because it’s necessary (and in some cases, sufficient) for productivity, it’s a skill that you need to master early. Of course, the question is, what tool should you use for data visualization? Long time readers of the Sharp Sight blog will know where I stand on this: I think that ggplot2 is a best-in-class data visualization tool, and arguably, the best data visualization tool. As it turns out, a recent 2016 survey by O’Reilly media also showed that ggplot2 is the most frequently used data visualization tool among employed data scientists. This provides some evidence that suggests that you should learn it, if you want to get a job as a data scientist. ggplot teaches you to how to think about visualizing your data. It teaches you how to think about visualization, because there are two deep principles that underly the syntax (and a third principle that sort of arises as a result of the first two). Understanding these will sharpen your intuition about how to visualize data and how to attack particular problems for which visual tools are a good solution. To understand these principles, how they operate, and why they’re so important, let’s look at an example. 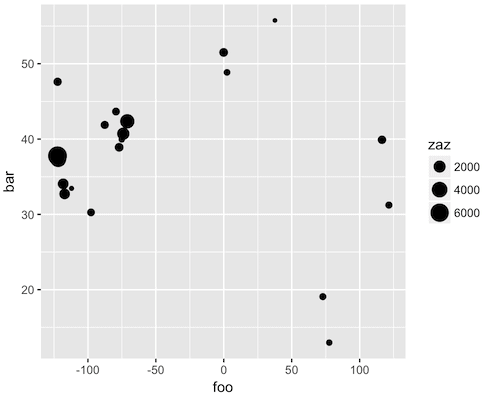 It has several numerical variables, so let's make a quick scatterplot out of two of them, foo and bar. #  since we already loaded "tidyverse"
Again, syntactically this is uncomplicated. Importantly though, underneath the syntax is a deep data visualization principle at work. Once you get this principle, your understanding of data visualization will change forever (and you'll become much more proficient with ggplot2). When we create this chart, we're actually mapping data to aesthetic attributes. To explain what that means, let's dissect the example a little bit. The points in the scatterplot are "geometric objects" that we draw. 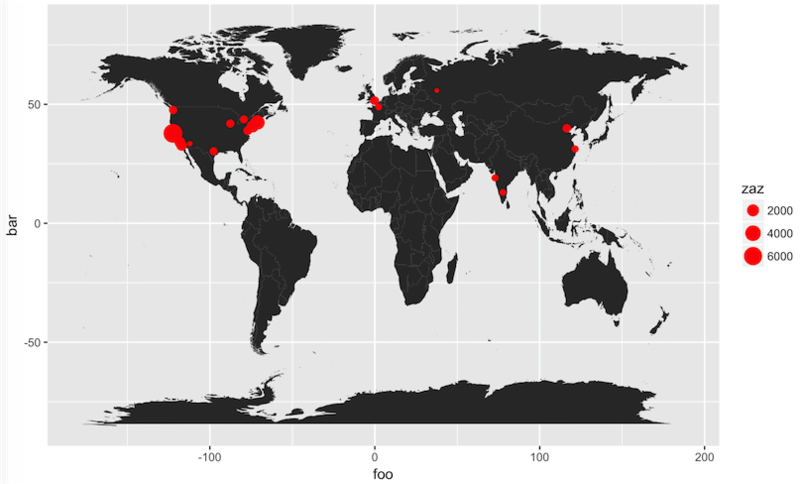 In ggplot2 lingo, the points are "geoms." More specifically, the points are "point geoms" that we can denote syntactically with geom_point(). When we create a data visualization in ggplot2, we're ultimately creating a mapping between variables in our data and the aesthetic attributes of the geometric objects in our visualization. When we visualize data, we are mapping between the variables in our data and the aesthetic attributes of the geometric objects that we plot. 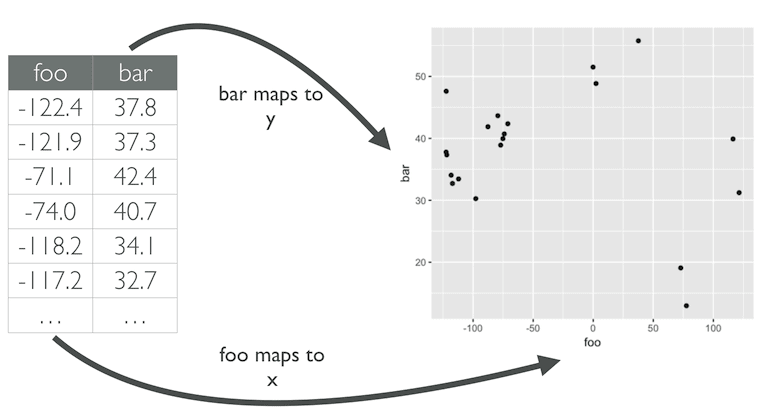 To bring this back to our simple scatterplot example, when we create this plot, we are mapping foo to the x-position aesthetic, and we're mapping bar to the y-position aesthetic. … 'foo' on the x-axis and 'bar' on the y-axis. … I can do that in Excel. " Understand: this is a simple example, but there's a very deep principle at work here. Theoretically, geometric objects (i.e., the things that we draw in a plot, like points) don't just have attributes like x-position and y-position. As I mentioned above, geometric objects have a variety of other aesthetic attributes like transparency, color, size, etc. Moreover, if we can map variables to attributes like x-position and y-position, we should be able to map variables to attributes like color and size, right? ... and this is exactly what ggplot2 allows you to do. Mapping variables to parts of your plot is not limited to the x and y axes in ggplot2. This is where ggplot2 begins to differentiate itself. ggplot2 allows us to manipulate that larger set of aesthetic attributes like color, size, transparency, and shape. More importantly, it allows us to map variables to essentially any of these aesthetics. To show you this, let's extend our example and create a bubble chart. All we need to do is map a new variable to the size aesthetic. We've transformed the simple scatterplot into a bubble chart by mapping a new variable to the size aesthetic. Let me say that again. We just changed a scatterplot to a bubble chart simply by mapping a new variable to the size aesthetic. In some simplistic sense, that's all we're really doing when we visualize data. When we create a visualization, we're ultimately creating a mapping from variables in the data to aesthetic attributes of the geometric objects that we draw. It's simple, but critical: any visualization you see can be deconstructed into geom specifications and mappings from data to the aesthetic attributes of those geometric objects. That might not sound like a big deal, but once you "get it" – once you really understand what this means – your approach to visualizing data will be changed forever. You'll look at more complex visualizations and understand that that they are easy to produce, if you know what geom to specify and how to map your variables. Nearly all visualizations become much easier to produce. In addition to learning to conceptualize visualizations as "mappings from data to aesthetics" there's another principle you need to understand: building plots in layers. To see what I mean, let's modify the bubble chart that I just showed you above. This is just the bubble chart from earlier in the post with a new layer added. That's. It. We just transformed a bubble chart into a new visualization called a "dot distribution map," which is much more insightful and much more visually interesting. In the beginning of the post (when we created our dataset), I didn't tell you that this is geospatial data. I didn't tell you, because I wanted you to see that this dot distribution map is essentially the same as a bubble chart, with a new layer of contextual information plotted underneath the bubbles. Moreover, as we saw earlier, the bubble chart is just a modified scatter plot. 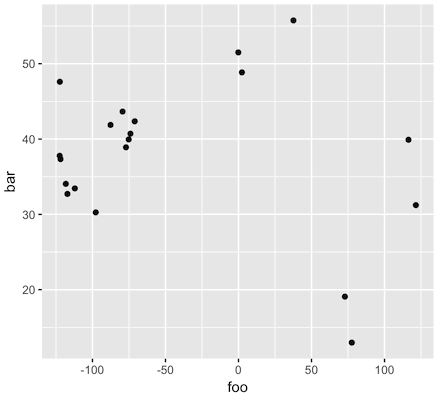 It's a scatterplot with an additional variable mapped to the size = parameter. So, this dot distribution map is just a bubble chart, and the bubble chart was just a scatterplot. To create the dot distribution map, we added a layer of polygon data under the bubbles. Mapping and layering. That's really the essence of it. To be come great a data visualization, you need to understand mapping variables to aesthetics and building plots in layers. These are two critical ideas that you need to understand, both technically (in order to write ggplot code), but also conceptually. You need to start viewing data visualizations in this way. Once you do, you can begin deconstructing complex visualizations into simple, modular components. Once you understand mapping and layering, you'll begin to see that many "complex" visualizations are in fact, quite simple to make (if you know how to think about putting them together). There's actually a third principle at work here, that I haven't mentioned yet: building plots iteratively. This principle is only related to the syntax in a cursory way, but it does arise as a consequence of the ggplot2 syntax. Part of becoming a data scientist is not only learning syntax, but also learning workflow. You need to learn processes. You won't learn workflow directly when you learn ggplot2 syntax, but learning visualization workflow is easier when you learn ggplot2, primarily because of the "layerability" of the syntax. When we build plots in layers, we are ultimately building a plot iteratively: we layer in new information, piece by piece, or modify existing parts of the plot, piece by piece. As an example, let's go back to the chart that we created above. We ultimately created a dot distribution map, but step-by-step, how did we actually build it? We created a bubble chart by modifying the scatterplot. We essentially mapped a new variable to the "size" aesthetic. We layered in polygons to show the shape of the countries underneath the points. Ultimately, we can break down the creation of the dot distribution map into discrete steps. We built the map iteratively. To a beginner, this finalized chart probably looks difficult to create. But, once you understand how to build a plot iteratively (in layers) it becomes easy. My point is that ggplot's syntactic layerability enables and rewards iteration. The structure of the syntax sort of requires you to build plots in layers, and this in turn builds your intuition about iteration and data visualization workflow. Ultimately, this knowledge about workflow is language-agnostic and transferable if you move to another tool. ggplot2 is an excellent tool for getting things done as a real world data scientist, but it also trains your mind how to think about visualizing data. Now, I will admit that ggplot2 has a bit of a learning curve when you first get started, but once you "get it," data visualization becomes much easier. So by learning ggplot2, you are not just learning a toolkit. You also learn deep principles underlying data visualization. Once you learn these principles, your approach to visualizing data will change. Your ability to analyze data and create sophisticated visualizations will improve dramatically. In turn, by mastering visualization – a core, necessary skill – you'll become a better data scientist. You'll be better at getting things done. And when you want to move on to higher-level skills like advanced visualization or machine learning, you'll have the foundation you need. Discover how to rapidly learn ggplot2 (and other critical R packages). If you sign up, you'll get free tutorials about ggplot2 and other R tools, delivered to your inbox. At least in this case, the aesthetics that define the points are all together. But it still doesn’t seem to make sense that the aesthetic mapping is separate from the point geom. Which then leads to the question; why isn’t the proper syntax this? In this case, we have data, we have a geom we want to use, and we map a bunch of aesthetics to that goem. I know it doesn’t work this way, but for me that would make more intuitive sense. I’m sure there are very good reasons why it is this way, but it does make things harder. Anyway, I use ggplot2 for all the reasons you state, but there are things about the syntactical structure that just don’t seem to align intuitively with how ggplot2 purports to works, at least from a design perspective. Keep up the good work, as I enjoy the posts. How the code syntax you suggest work in situations where you are layering multiple geoms…? When you start adding layers, though, such as a map like in the example, or a regression line, you will find out that some of the aesthetics will apply to all your layers (in all these examples it will be x and y), while the size aesthetic will only make sense for the point geom. That’s why it makes sense to put the aesthetic mapping for x and y in the original ggplot call, and the size aesthetic in the geom call. Thank you for outlining these three principles. Helps one to apply structured thinking when constructing visualizations. Great post! 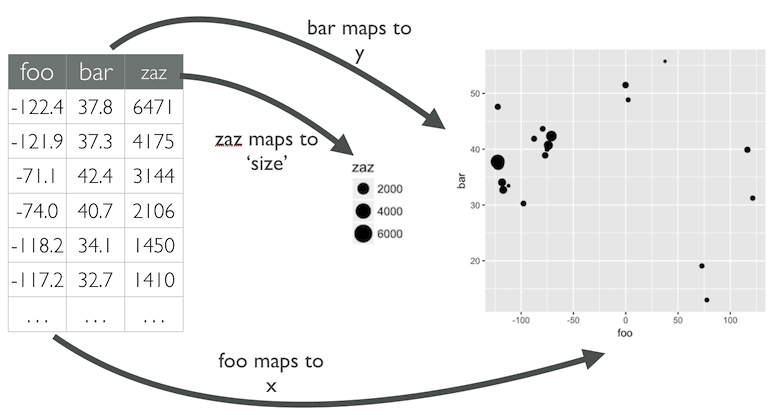 You have a very good way of explaining the visualization process in ggplot2 and still make it simple to understand it. No question it is an awesome package. I’m diving into it to learn as much as I can. Many thanks for sharing your knowledge. great article. When is your course content going to be ready? I’m going to re-open the course for enrollment in about 6-8 weeks. Great post – I like the way you broke down and illustrated the conceptual ideas of aesthetics and layering. I’ve long appreciated the expressive power of ggplot2’s syntax without pausing to reflect on how and why this is the case.